I saw an eight to ten foot example of this in Honduras -with square stems spiked all along the four corners. I have photos of the infls. too. Do you know the species , if it is available in US and whether it can be grown in containers in a greenhouse. It is really spectacular. Susan, thanks for sharing this photo with us. It is of an unusually HUGE specimen of Cyrtosperma johnstonii, an aquatic aroid from the Solomon Islands in the Pacific, and is related to the larger, all-green specimen of another even larger (to 18 ft.!) Cyrtosperma species, C. merkusii (which is grown on some Pacific coral atols for its huge edible corm!). A wonderful plant of this species was still growing at the waterfall just down the steps from where this photo of C. johnstonii was taken. In cultivation, C. johnstonii, which as a smaller plant is beautifully marked with pinkish/red blotches and has snake-like markings on its petioles, is said to have originated from a single collection made many years ago on Buka Island in the Solomon Islands group. As can be imagined, it reproduces VERY quickly by suckers or off-shoots, and has never been seen to produce fertile fruit in cultivation. Smaller plants are usually available for sale at the IAS show at Fairchild in September. This and many other valuable and beautiful aroids seem to have been taken off or out of the display areas at Fairchild, and we can only HOPE that many are still in some sort of ''holding area'' at that establishment, and may sometime in the hopefully near future reappear as display subjects. It is available in the US, touchy to grow unless greenhoused or warm weather location, someone told me once that if you put an ice cube in your mouth and blow on the plant, it would die! In other words, VERY cold sensitive. Now it is known as Cyrtosperma johnstonii, needs to sit in water or grow on the edge of water, hopefully more can chime in, as I don't grow it.... Julius knows lots about it and Dewey and Enid grow it (or grew it) as far as I know. Wish it was easier- I love those petioles! wed, a few are straight and tubular. Lots more valuable information, including photos and instructions for their cultivation of these most interesting aquatic species can be seen in my papers --" Boos, J. O. 1993. Experiencing Urospathas. Aroideana 16: 33-36", and "Boos, J. O. 1997. Observations on New World Araceae-Lasieae. Aroideana 20: 13-26." Additional information on this and all other genera can be had in Deni Bown`s remarkable book, "Aroids Plants of the Arum Family", Timber Press, ISBN 0-88192-485-7. Enid at Natural Selections is a source for these plants, sometimes in short supply. Susan, the name Alocasia johnstonii was a big error, they are very different to and a seperate genus/group to Alocasias. I look forward to hearing from you with more information! > I saw an eight to ten foot example of this in Honduras -with square stems spiked all along the four corners. I have photos of the infls. too. Do you know the species , if it is available in US and whether it can be grown in containers in a greenhouse. It is really spectacular. The problem is, that the biggest leaves start browning from the margins, and then spotting the whole leaf blade. At the same time the petioles bend over and after a short while the leaves are gone. What can be wrong??? I think, I can offer them optimal conditions, standing next to the difficult Alocasias ("little jewels"), which I now have under control. Thanks for your experts advise! > pathe, some species are cork-screwed, a few are straight and tubular. > Lots more valuable information, including photos and instructions for their cultivation of these most interesting aquatic species can be seen in my papers --" Boos, J. O. 1993. Experiencing Urospathas. Aroideana 16: 33-36", and "Boos, J. O. 1997. Observations on New World Araceae-Lasieae. Aroideana 20: 13-26." > Additional information on this and all other genera can be had in Deni Bown`s remarkable book, "Aroids Plants of the Arum Family", Timber Press, ISBN 0-88192-485-7. > Enid at Natural Selections is a source for these plants, sometimes in short supply. 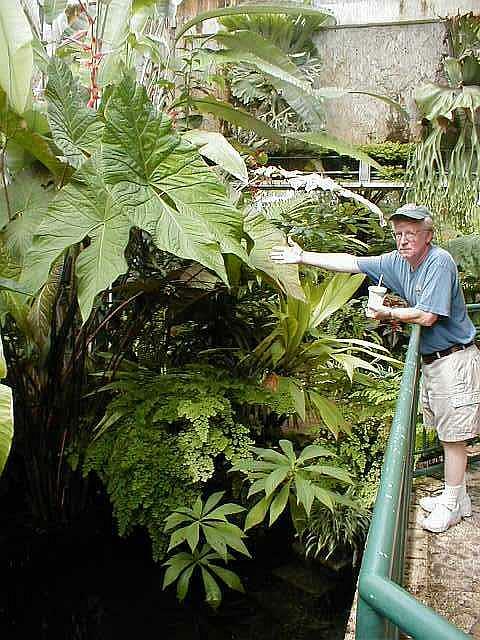 > Susan, the name Alocasia johnstonii was a big error, they are very different to and a seperate genus/group to Alocasias. > I look forward to hearing from you with more information! > > I saw an eight to ten foot example of this in Honduras -with square stems spiked all along the four corners. I have photos of the infls. too. Do you know the species , if it is available in US and whether it can be grown in containers in a greenhouse. It is really spectacular. aroids. The best results I have seen are using the following techniques. occurs it is almost always from the cold water. sensitive and difficult novelty Alocasias. > 33-36", and "Boos, J. O. 1997. Observations on New World Araceae-Lasieae. > different to and a seperate genus/group to Alocasias. > > stems spiked all along the four corners. I have photos of the infls. > > can be grown in containers in a greenhouse. It is really spectacular. > > Never miss a thing. Make Yahoo your homepage. attest to Julius' method for growing semi-aquatics. offer this plant for sale, along with other Aroids. House of course, that was at least 10 feet tall, and perhaps 5 feet in diameter. The plant was happily growing in the pond of that greenhouse. That was my first introduction to this member of the Aroid family. fitted with a side bottom drain. This makes emptying the tub easier. mineral product, which will maintain a neutral to slightly acid pH. I combine this with a small amount of modified soilless media. This is composed of brick cut sphagnum peat moss,well aged compost,and rice hulls. which likes moisture, but doesn't always like to have wet feet. In theory, this mix provides organic matter, but should not contribute to rotting. more or all aquatic media,as well as larger stones or slate chips. I screen off the drain holes, to prevent media washing out of the container. As has been already mentioned, water temperature is very important. water temperature. Once outdoors,a heater is used until Summer weather warms thing up. cold weather. However, they are a remarkable addition to any Aroid growers collection. Here in the Midwest, we have to work a bit harder to keep our tropical plants happy. Bird's Botanicals has Cyrtosperma johnsonii. named "Scratchy" by everyone who had to be in the car with it. I can attest to its cold sensitivity, as mentioned by Julius and others. and, of course, where I'm within its reach when I'm in there.